HIT! Super cheap flights to India: Hyderabad and Bangalore from €251! If you would like to visit India there’s no better time than right now! 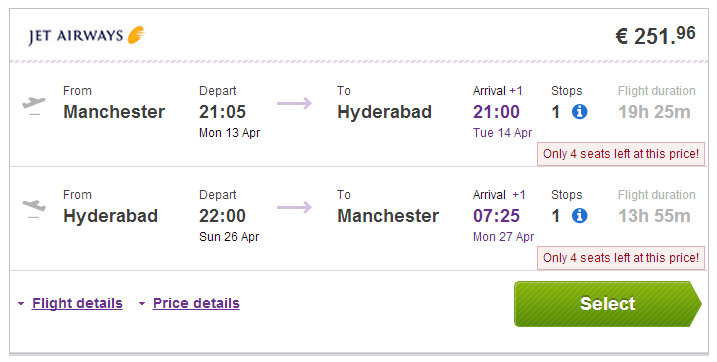 Return flights from Manchester to Hyderabad are available for record low €251! Hyderabad is the capital city of the Indian state of Telangana in South India. You can also fly to Bangalore for €269! Manchester is linked through low cost airlinest with most major airports in Europe – check Jet2, Easyjet or Ryanair. Flights are operated by Etihad under Jet Airways with 1 stopover in Abu Dhabi. Travel dates are from April to July 2015. Hyderabad is huge city with almost 4 million people in its metropolitan area, so you can be sure there is accommodation of all kinds and it’s rather cheap. The prices start at around €10 for double room in simple two star hotels. « Cheap flights to Vietnam: Hanoi from Prague for €483!